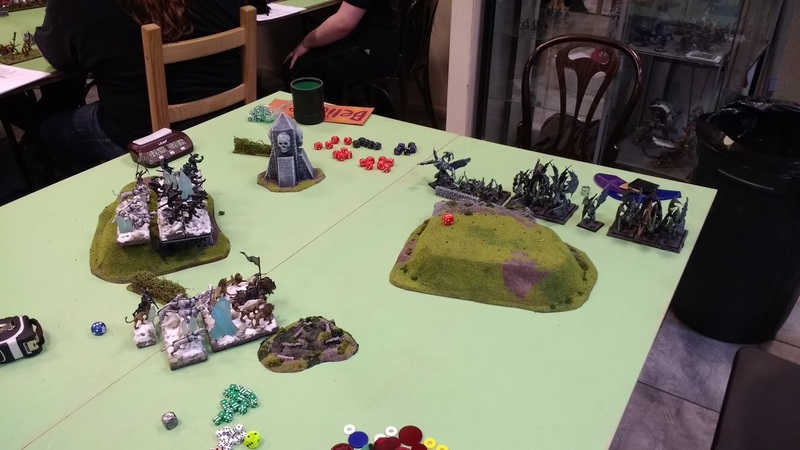 Darklord - King of War: Aire Conflict - Hobby Tastic! Aire Conflict - Hobby Tastic! The biggest difference though was you got additional points for hobby and sports, now to those over in the US this is the norm, not so for us in the UK. Personally I was happy to give it a go and have been putting more and more effort into my army to try and improve myself. 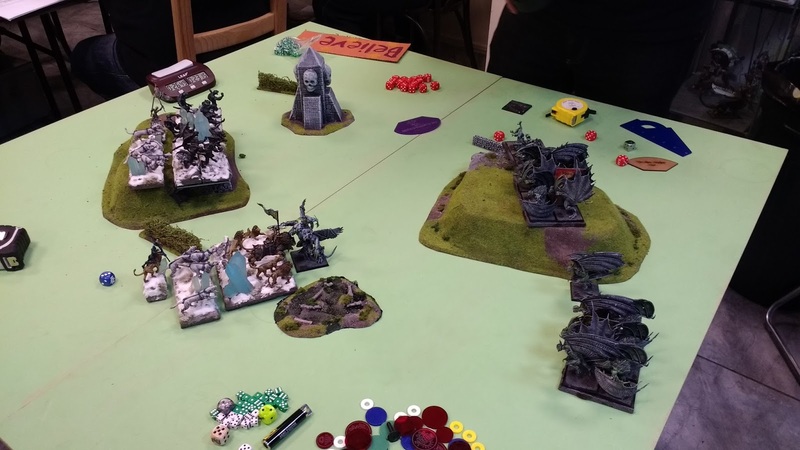 Game 1 - Chris Silkstone - Orcs, Push. Chris had only played a few times before, so he was never going to have an easy time of it, I think by the end of the game he had picked up some tips and tricks though so that's good! He ran his chariot forward and let me charge it with my Stampede, not recommnended and an easy rout. My Lycans progressed round the right flank while chaff delayed his horde on the left flank. The Morax kept turnning to face the Lycans who happily ran around to the flank and then the rear before finally charging something else leaving the mor-ax looking at nothing. Over the next few turns I routed everything for a big win. I've played against Steve several times before and they've always been great close close games, this time he had Goblins rater than his usual TK. As you can see below, his army was huge compared to mine! 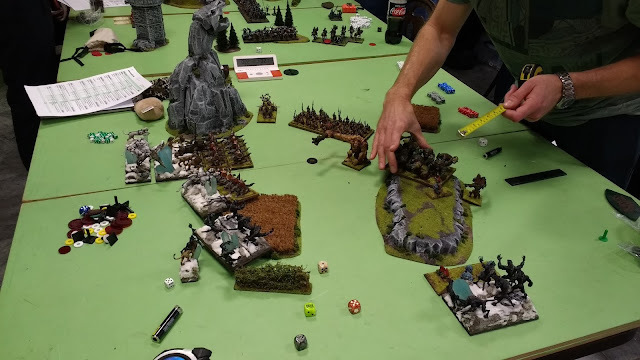 Steve maneuvered carefully on my left, but on the right allowed me to zoom forward my Lycans, he then made a fatal mistake (actually pictured doing it below!) He placed Trolls giving me a Nimble flank charge with My Lycans into them, This proved terrible and his flank collapsed. In the centre My Stampede was held up by first Fleabags and then the King on Chariot and Giant, but with a bit f healing they held out, till everything else was dead, giving me a big win. As you can see below we both took a corner and edged towards each other slowly, his Tree herder was hidden behind the ruins at the top, and he and some Luycans and a Beast pack spent most of the game duking it out! Meanwhile in the centre I was able to perform the clasic chaff block, using a chaff beast pack to block the charges of two units, this meant I was able to concentrate on his units one at a time with my Stampede. 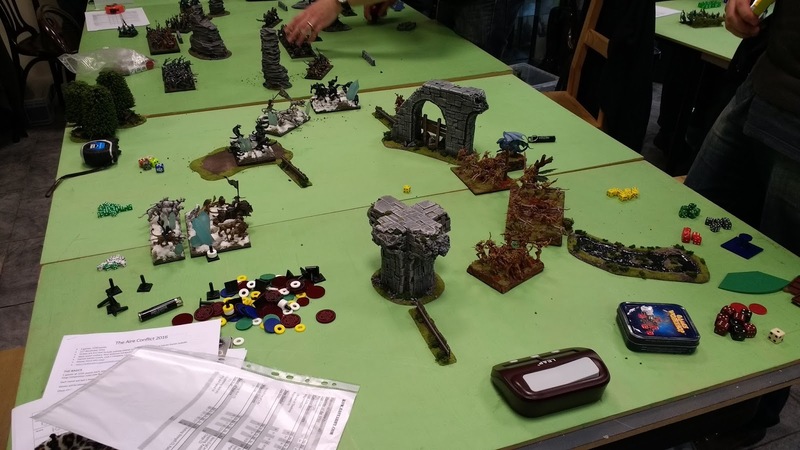 They did take some heavy damage from the Hunters of the Wild, but it wasn't enough and as the dust settled I'd routed pretty much everything for a 3rd big win! Ah Nick, the TO and a good friend of mine, he'd been doing really well despite taking a relatively fluffy list! He was getting worried that he would win his own event, I was happy to help knock him down. 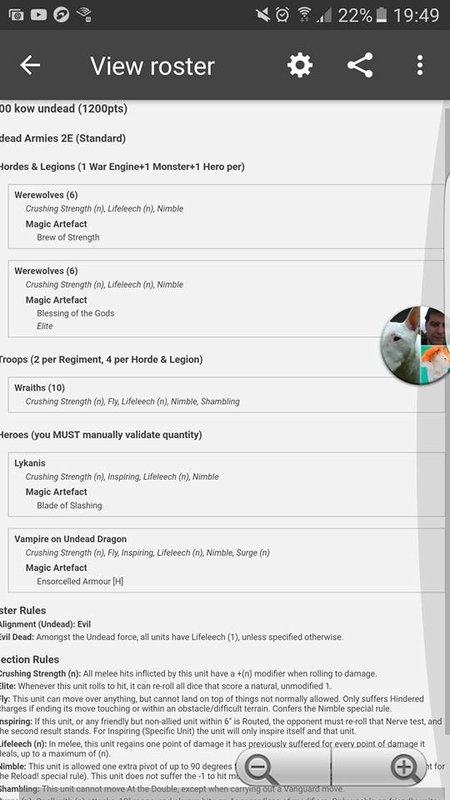 :p As you can see below he had a nice mix of units. His armies strength was the high nerve of all the hordes, trouble is my army has an extreme damage output, pretty much the counter to his army. The face off below, Nick was determined to hold the pillage marker in the difficult terrain, He offered me some front charges with my Lycans, but I declined to take them, I swung round behind instead with my bottom Lycans. If I had he may have been able to counterattack and start getting an advantage. 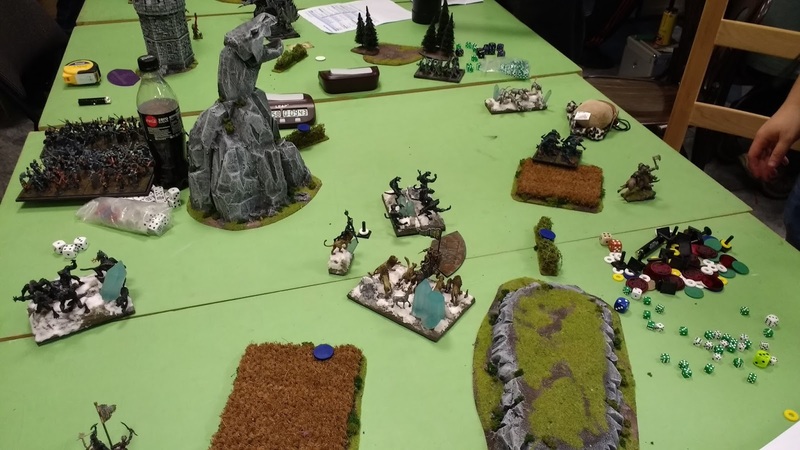 On Nicks turn he was now in a tough spot, he turned the Spears towards the Lycans, but my Stampede came into the flank instead and left them a crushed mess. The revenants did get a chance to charge my Stampede then, but with the difficult terrain they were unable to do much damage. net turn I wiped out the remainder of the centre. Now in the distance my Chaff was dancing with the Werewolves, this delayed them just long enough that they were unable to do anything worthwhile allowing me to concentrate on the centre. After this Nick had a slight chance of routing something of mine, but decided rather more sensibly to run away! Props to his Revenant King who ended up killing my chaff all by himself! As the dust settled I had a decent win, but only killed around 700 pts worth or so. 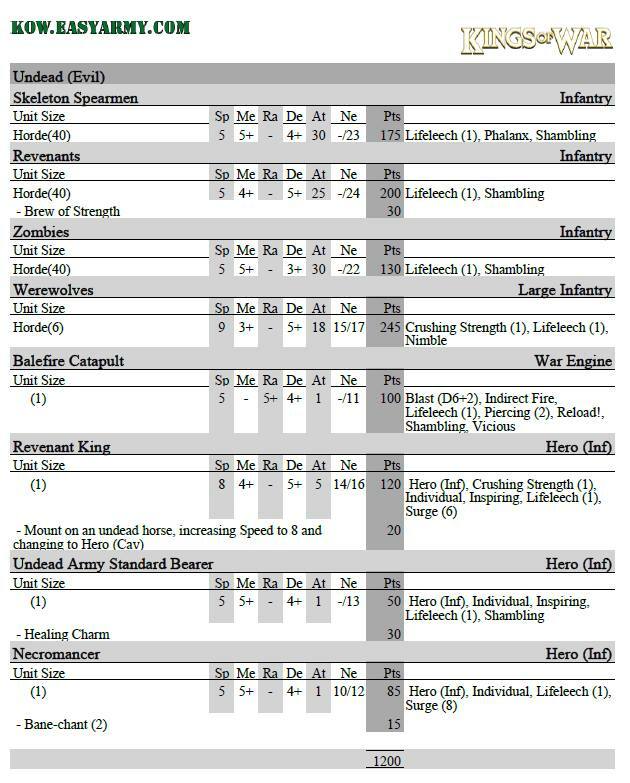 We'd discussed lists at length in the run up, and we had similar armies, despite his being Undead and mine Herd. He'd been doing really well with it, and if he could get a big win in this game would win the event, so it was all to play for! Walter spotted this and took full advantage! Charging the Dragon straight in, bother! It was ok though, the Stampede didn't waver and my countercharge damaged the Dragon too, I then maneuvered the rest of the army hoping to kill it next time. 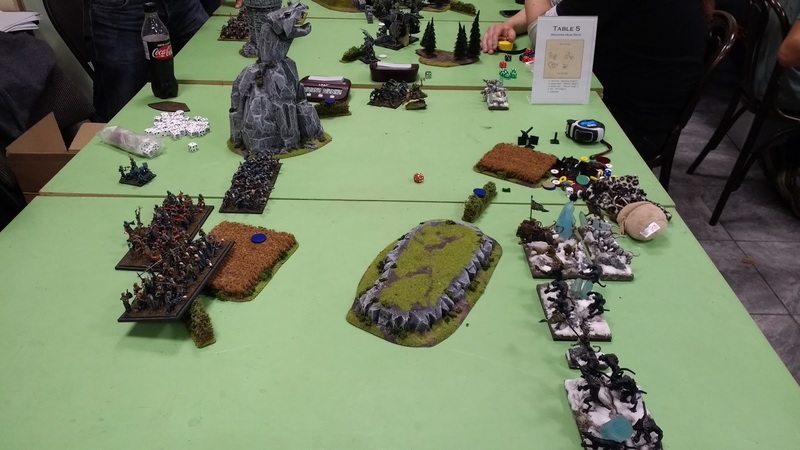 Meanwhile the Werewolves came in to the Stampede comboing with the Dragon, but with amazing luck my Stampede still didn''t rout! This meant I was able to flank the Dragon and take it down, and also rout some annoying Wraiths, that had charged my Lycans. Back to Walter, he finally killed the Stampede, but then I managed to kill his other Werwolves! He was now down to just a single Werewolf Horde! It bravely charged an undamaged Lycan horde and popped it! I was down to just the units you see below, now it was really close! My Lycans tried to take it out and failed! It was now my final turn, I decided to go for it, and use my characters to win the Invade, I need to kill the Werewolves to succeed! And I did, giving me a win, but certainly not a big one! Really great tactical game! And that was it, I came 1st, full results below! Richard Heath won best painted with his lovely Nature army. It had been a great day, and Nick really excelled himself, the gifts we received were amazing just look at the gift bag we all got! The trophies were great, I got a glass pint mug and a shot glass for best general too! I even won vouchers for the shop! Crazy! The terrain espcially was amazing, all made specially by Nick himself. I particularly liked Dragon mountain! Playing smaller games made a nice change too, can't wait for the next Aire Conflict! The biggest CoK so far!